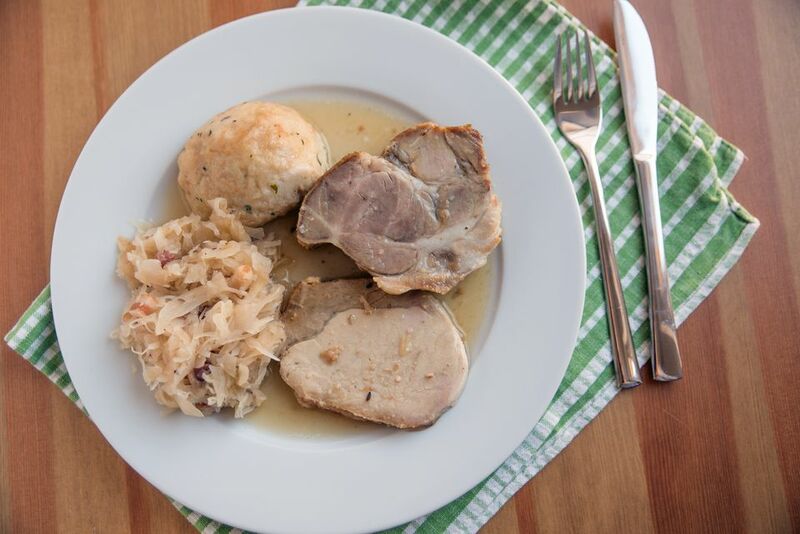 Apple cider adds flavor to the braised pork loin and cabbage in this easy main dish combination. Feel free to omit the potatoes or cook them separately. Add some sliced carrots and diced rutabaga along with the potatoes if you'd like. Pat the pork roast with paper towels to dry. Season all over with salt and pepper. Peel the onion, cut it in half, and chop. Peel and mince the garlic. Melt 2 tablespoons of the butter in a large braising pan or Dutch oven over medium heat. When the butter is hot, add the onions; cook until translucent. Remove the onions to a plate and set aside. Add the remaining 2 tablespoons of butter. Add the pork roast and brown on all sides. Add the minced garlic. Remove outer leaves from the cabbage and then cut into 6 to 8 wedges or chop coarsely. Arrange the cabbage around the pork roast. In a cup, combine the apple juice, honey, and vinegar; stir in the dried leaf thyme. Pour over the pork and cabbage. Cover the pan and transfer to the oven. Bake for 2 hours. Scrub the fingerling potatoes and add them to the pork and cabbage. Cover and bake for 45 minutes to 1 hour longer. Pork should register at least 145 on an instant-read thermometer inserted into the center of the roast.